Celebrating Great People With Greater Names. Taylor Harry Fritz–er, or is it Fritz Harry Taylor? “Nobody beats Vitas Gerulaitis 17 times in a row.”–Vitas Gerulaitis when he finally beat Jimmy Connors after losing to him 16 straight times. Here at The Blog of Funny Names, we’ve always had a fascination with people who have two last names. Outerbridge Horsey is the classic. Then of course, there are those that have two first names–like the eponymous Tommy John. But seldom have we come across somebody whose name appears to be backwards. 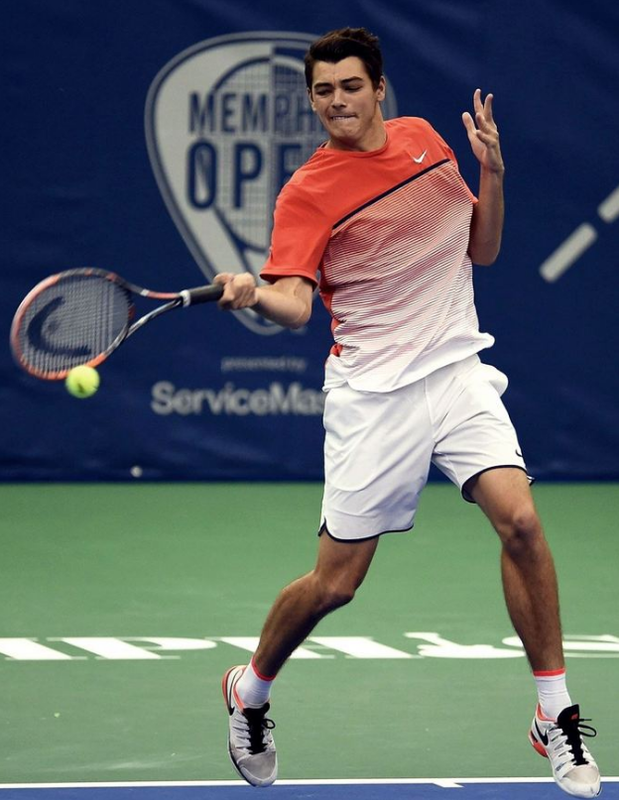 But that would appear to be the case with rising 18-year-old American tennis star, Taylor Harry Fritz. If his name was Fritz Harry Taylor, we wouldn’t consider feting him in these hallowed pages. Or Harry Fritz Taylor, or even Harry Taylor Fritz. It’s as if the names were picked out of a hat to come in that order. However you order his names, Taylor Fritz may just be the guy to change all that. He won the 2015 junior boys title at the US Open and finished the year as the top ranked junior in the world. And after turning pro in 2016? He won his first ATP tour title, qualified for the Australian Open, and has jumped to #65 in the world from a ranking in the 600’s in just a few months. He is the youngest player currently in the top 100. Last week at a tournament in Stuttgart, Germany, he got a real taste of the big time, meeting all–time great Roger Federer in the second round. He lost, but gave Federer a run for his money at 4-6, 7-5, 4-6. I don’t know if Federer will be around long enough for Fritz to play him 17 times, but I’d bet he won’t need that many to beat him. And that goes no matter what order you say his names in. As for me, if you’re tired of my first blog, The Millennium Conjectures, you can go to my new, second blog, Seeking Delphi, and mock me there. This entry was posted in funny names in sports and tagged Andy Roddick, funny names, Jimmy Connors, John Isner, Mardy Fish, outerbridge horsey, Roger Federer, Taylor Fritz, tennis, Vitas Gerulaitis. Bookmark the permalink. 4 Responses to Taylor Harry Fritz–er, or is it Fritz Harry Taylor? I miss Mardy Fish… that name belongs in the top 5. It’s a gosh-darn shame we are lacking the American men Tennis stars, but let’s hope Mr. Fritz is our fella! No arguing that his name is backwards. I’m sure he would love the image you chose as well; sports shots can appear unflattering. Are you sure Mardy Fish wasn’t an old comedian back in the Poconos? Nope. He really was a US Tennis player, I even saw him play here at the New Haven open a couple of times. Get all the funny named updates as they drop. Don't miss out on the fun!